Schwarzenegger likes the idea of Hillary Clinton as Secretary of State. (CNN) - California Gov. Arnold Schwarzenegger weighed in on the possibility of Hillary Clinton becoming President-elect Barack Obama's Secretary State, praising the potential choice as a "great move." "I think she is a very very bright woman and very experienced. 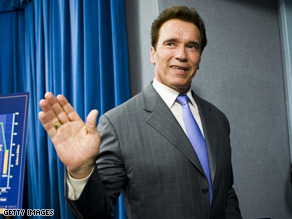 I think this could be a great move," Schwarzenegger told ABC's George Stephanopoulos in an interview set to air Sunday. But Schwarzenegger, a Republican, also suggested Obama must be sure he can work with his former primary rival before he officially offers her the position. "When it comes to those kinds of positions, what is equally as important, and I know with my cabinet, what is equally as important as who is qualified, is who can you work with. Who can you sit down with and really get in there and start becoming a partner [with], that sees things the way you see it," he said. "And also that you maybe want to learn from that person and admire that person so much that you want to pick up some pointers and learn from that person, so that they together can go out and do this," Schwarzenegger also said. Sources told CNN Friday Obama met with Clinton in Chicago Thursday to gauge the New York senator's interest in the top diplomatic post. Sources also told CNN Obama is considering New Mexico Gov. Bill Richardson for the position. Clinton would not comment on the speculation Friday. CHICAGO (CNN) - Prominent Washington lawyer Greg Craig will be named White House counsel for the Obama administration, a Democratic source tells CNN. The source added that it is unclear when the appointment will be made public. Craig first gained prominence representing President Clinton in the Senate impeachment trial, but he endorsed Barack Obama over Hillary Clinton in the Democratic primaries and later played a key role in Obama's vice presidential vetting process. CNN reported Friday that Craig was under stong consideration to be named as the incoming president's top lawyer, according to three officials close to the presidential transition. One of those officials said Craig was "highly regarded" and trusted for his discretion by Obama. 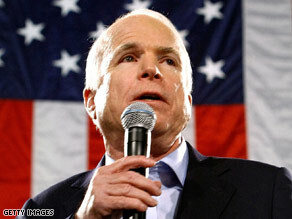 A Republican senator hammered John McCain on Friday. MYRTLE BEACH, South Carolina (CNN) - South Carolina Sen. Jim DeMint on Friday became one of the first high-profile Republicans to publicly criticize John McCain following his electoral defeat, blaming the Arizona senator for betraying conservative principles in his quest for the White House. The conservative senator, speaking to a group of GOP officials gathered in Myrtle Beach at a conference on the future of the Republican Party, described how the party had strayed from its own "brand," which, according to DeMint, should represent freedom, religious-based values and limited government. "We have to be honest, and there's a lot of blame to go around, but I have to mention George Bush, and I have to mention Ted Stevens, and I'm afraid I even have to mention John McCain," he said. DeMint offered a long list of complaints about McCain's record in the Senate and on the campaign trail. "McCain, who is proponent of campaign finance reform that weakened party organizations and basically put George Soros in the driver's seat," DeMint said. "His proposal for amnesty for illegals. His support of global warming, cap-and-trade programs that will put another burden on our economy. And of course, his embrace of the bailout right before the election was probably the nail in our coffin this last election. And he has been an opponent of drilling in ANWR, at a time when energy is so important. It really didn't fit the label, but he was our package." Jarrett is a longtime adviser to Obama. WASHINGTON (CNN) - A longtime friend of Barack and Michelle Obama has officially been named a senior advisor to the incoming president. 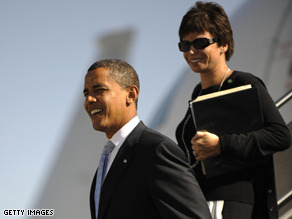 President-elect Obama, in a statement released Saturday morning by his transition staff, announced that Valerie Jarrett will serve as Senior Advisor and Assistant to the President for Intergovernmental Relations and Public Liaison. CNN Contributor Roland Martin reported the offer to Jarrett on Friday evening. Jarrett is currently co-chair of Obama's transition team and was senior adviser for his presidential campaign. She became the president and CEO of The Habitat Company on January 31, 2007, and was also the company's vice president. The Habitat Company develops and manages residential apartments and condominiums. Before joining The Habitat Company, Jarrett served for eight years in government for the city of Chicago; first as deputy corporation counsel for finance and development, then as deputy chief of staff for Mayor Richard M. Daley and finally as commissioner of the Department of Planning and Development. Obama said an economic stimulus package will be his first priority. (CNN) - President-elect Barack Obama urged Congress on Saturday to work next week on a plan to help the country's economy and in particular address unemployment insurance. "If Congress does not pass an immediate plan that gives the economy the boost it needs, I will make it my first order of business as president," he said in his weekly address, which is posted online. "I urge them to pass at least a down payment on a rescue plan that will create jobs, relieve the squeeze on families and help get the economy growing again," he said. "In particular, we cannot afford to delay providing help for the more than one million Americans who will have exhausted their unemployment insurance by the end of this year." According to a CNN/Opinion Research Corporation poll released Thursday, 76 percent of Americans said they believe it is likely that Obama will improve economic conditions. In addition, 73 percent of those surveyed said they believe that Obama will bring stability to the financial markets. 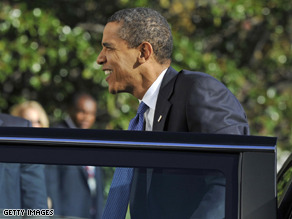 Obama, who won 53 percent of the popular vote on November 4, takes office January 20. Many have compared the obstacles that face him to those Franklin Delano Roosevelt confronted when he won the 1932 election. "Make no mistake," Obama warned Saturday. "This is the greatest economic challenge of our times." However, he added, "I am more hopeful than ever that America will rise once again."